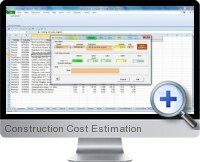 An essential suite of MS Excel based construction cost estimating and job costing software. Within each estimator, you can now work in a single MS Excel environment to quickly create, build, and manage your estimates. This collection offers a considerable saving off of the combined individual prices of the templates. Links are provided here to read more about each template or purchase individually. Convenient MS Excel based estimating. Product of our expertise in cost estimating since 1986. Customizable, flexible, built-in unit cost data in industry-standard CSI format (MasterFormat). Local cost data updated quarterly. Start-up wizard for creating fast estimates. Cost data includes all standard construction cost categories. Flexibility to create your own cost category to replace supplied ones. Modifiable overhead and profit applications. Accurate construction cost estimates in minutes. Customizable, flexible, built-in unit cost data. Cost data includes all standard remodel cost categories. Accurate remodel cost estimating in minutes. Customizable, built-in unit cost data for material and labor. Computes Material and Labor costs. Estimate Labor man hour report for easy scheduling. Formal bid quotation generated automatically. Incorporates user-defined progress payment schedules. Customizable, built-in unit cost data. MS Excel based programming for convenience. Identifies progress by cost item. Includes budget, actual and committed costs. Accurately forecasts costs at completion of project. Instant, on screen variances from budget amounts. Warns over budget items and variances. Provides planning and control data beyond Quicken Books, Peachtree and other accounting programs. Helps to avoid losses by identifying problems early. Complete job cost management and planning tool. These templates can generate instant, on-screen reports. Click a button to print or format like any MS Excel spreadsheet file. You can use Excel's powerful data saving and exporting tools for managing and distributing your estimates in electronic format and as email attachment. Because costs change in time, research and database costs are updated quarterly. These estimator templates come with a guarantee of free software updates with no additional charges or no recurring costs. The estimating software and built-in data is always up to date.